An incredibly fair spelling trick that's easy to do. The magician asks a spectator to name ANY card in the pack. This is an absolutely free choice - there is no forcing at all, we promise! 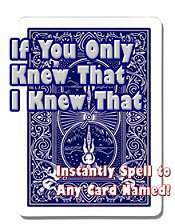 Now, without any funny moves, buckles, or untoward monkeying with the deck, the magician instantly spells to the card! This miraculous demonstration is proof that you knew, unquestionably, what card the spectator would name, even before he did! Yes, it's that direct. Yes, it looks just like that. Yes, you can do it easily. And no, it doesn't require any challenging sleight of hand. Perhaps best of all, after you perform the trick, you can go on to perform other effects with this seemingly innocent deck.